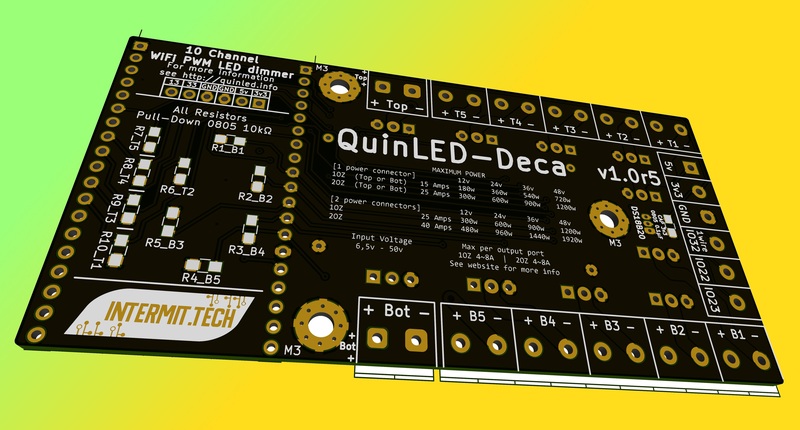 QuinLED-Deca is a 10 Channel WiFi connected PWM LED dimmer. This main design goal for this board board was a lot of channels with a decent power handling. 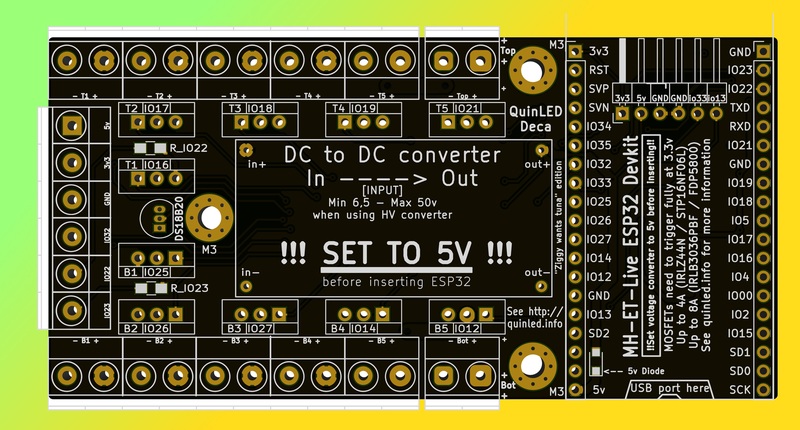 This board also accepts up to 50v input and output voltage making it suitable for a wide range of LED lights (from strips to COB modules). The 10 channels can be controlled independently or you can hook up for instance 5x CCT (CW/WW) strips or 2x RGB+CCT (RGB+CW+WW) strips. Voltage input and output between ~6.5v to 50v! Power handling depends on the amount of copper that is applied to the PCB. Generally these values are 1OZ by default or 2OZ if you pay extra. Depending on your needs you need to select the right amount of copper you need in your boards. This board has a top and bottom power in. Both are connected together and each will power all of the outputs independently or together. 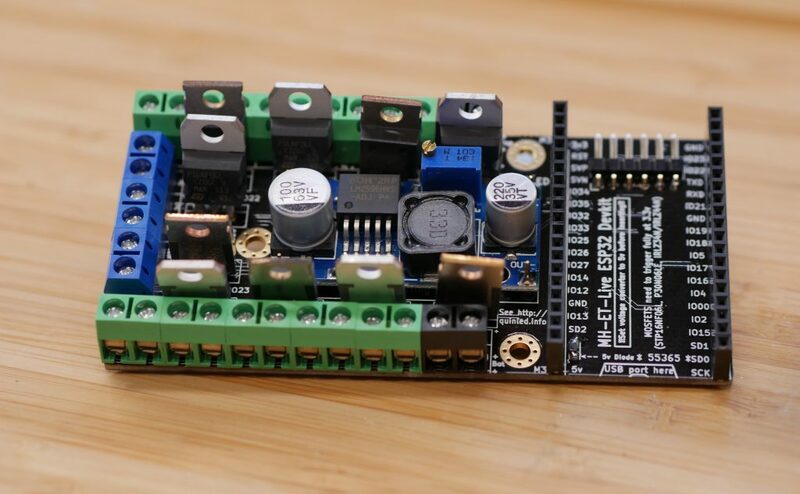 Still, if for instance you are only going to use the top ports on the board, also power the board using the top power input port because it’s closest and thus transfers power easiest. For high power applications it’s very much recommended to hook up both power input ports to your power supply (often they also have multiple output ports). 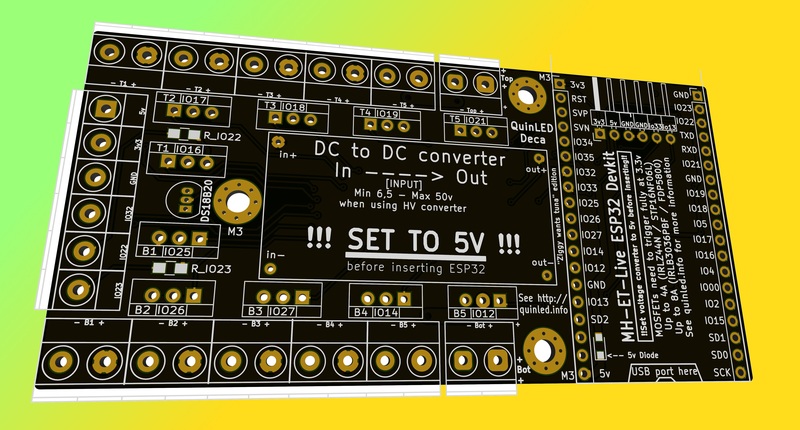 *One board only needs a single power connection, for higher loads use both power connectors to the same power supply! *Hooking up multiple power supplies is possible, but not recommended! Research before doing so! 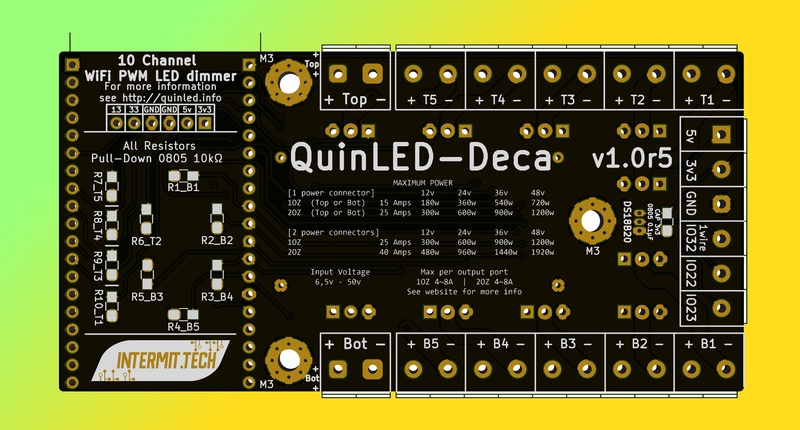 The QuinLED-Deca uses an auto-scaling DC-DC converter for it’s onboard electronics. It and the MOSFETs can accept a maximum of 50v. It requires a minimum of 6.5v to operate correctly.